This Made in the USA kitchen essential isn’t just a garlic crusher—it can also mince up ginger, olives, nuts, and herbs. Its specially designed grooves separate the chopped up pieces so that it’s easy to remove them, then clean. Dimensions: 3" x 3" x 1.5"
This is so much better than using a garlic press. 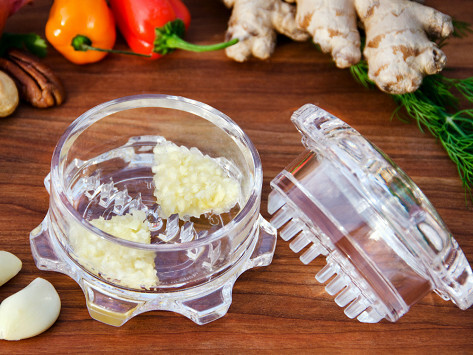 This Made in the USA kitchen essential isn’t just a garlic crusher—it can also mince up ginger, olives, nuts, and herbs with a couple of quick twists. Twist in one direction until the contents form into two triangles. Then twist in the opposite direction to consolidate the pieces together and off of the teeth. The contents are easy to remove and it’s simple to clean. 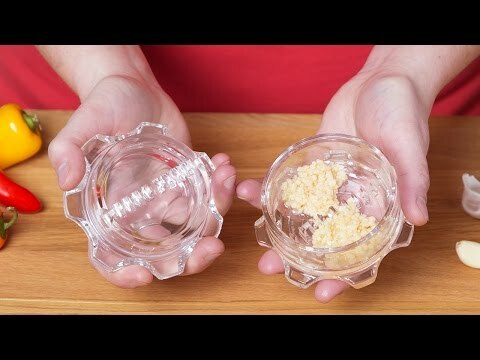 Use this time saver to quickly chop up herbs and garlic—and keep them off your hands.